Jakarta, Indonesia (AP) — Sun Yang will have to compete for attention at the Asian Games after all. His bid to win five gold medals has already been sunk after China was beaten in Monday’s 4×200-meter freestyle relay, though it was no fault of his. He’d won the 200 freestyle on Day 1 and the 800 gold on Day 2 less than two hours before the relay. China was well behind Japan when Sun dived in for the anchor leg, only to come up inches short in the lunge to the wall. Sun has another rival, though not in any of his races. 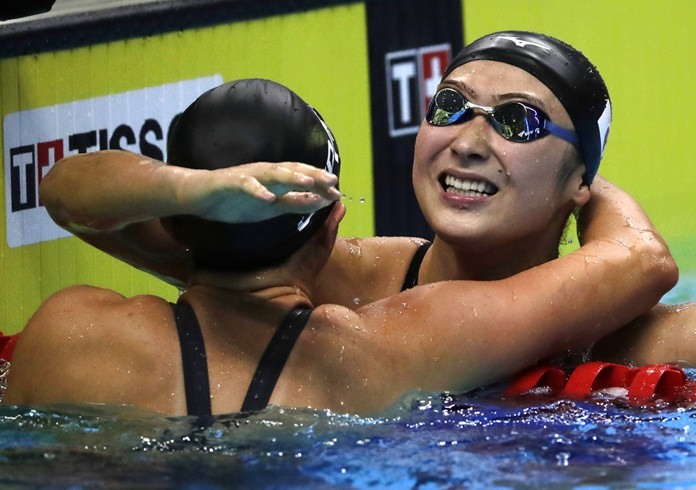 Japanese teenager Rikako Ikee has surpassed Sun by winning three gold medals already in Jakarta, including a relay on the first night, and appears to be in the mood to win plenty more. While Sun came up short in his attempt to win two golds in two hours, Ikee managed two inside of 45 minutes and made it look easy. The 18-year-old Ikee, who has surfaced as one of Japan’s great hopes for the 2020 Tokyo Olympics, won the women’s 50-metres butterfly final then returned to the pool to win the 100 freestyle. She also had a medal ceremony in between and had to go straight from the podium to the starting blocks for her second race. She won the butterfly in 25.55 seconds and the 100 freestyle in 53.27 and set Asian Games records in both events. Sun cruised to victory in the 800 freestyle, which was added to the Asian Games program for the first time since 1951, finishing 4.65 seconds ahead of his closest pursuer. He still has the 400 and 1,500 to race but his drive for five is over. “To train like this at my age is not easy, so I can feel satisfied with myself,” Sun said. “Today we lost (the relay) to Japan, firstly because Japan performed really well — they are always excellent and we need to learn from each other. It should encourage us to do better. China’s Xu Jiayu joined Sun by collecting his second gold of the Games when he won the men’s 50 backstroke final after taking out the 100 on day one. Kanako Watanbe, the 2015 world champion, retained her 200 breaststroke title but Kosuke Hagino — the outstanding swimmer of the last Asian Games when he won seven medals at Incheon — was beaten by China’s Shun Wang in the 200 medley. Hagino did avenge that defeat shortly after and pick up a gold in the relay with Shun taking silver as Japan drew level with China at the top of the swimming medals table with seven golds each. No other country has won a gold in the pool on the first two days of competition. South Korea has won two silvers and Singapore, Hong Kong and Vietnam each have a bronze.